Although it’s a bit of an odd topic for me to post about, I’ve received so many requests over the years to share my dental hygiene routine I decided it was about time I did! I actually have a quite thorough routine as I am particularly protective of my teeth and vigilant about my oral health. I’ve always been a keen brusher and flosser, but sadly my teeth need extra TLC as I have issues with soft enamel which makes the protective coating of my teeth far less effective naturally. I was a bit of an overly aggressive brusher as a child and this combined with my soft enamel led to some pretty severe gum receding. Over the past decade I have honed my routine to properly address these specific issues based on advice from my dentist. In addition to this, I have had bonding work done (which basically creates fake enamel) at my gum line on most of my molars to protect that sensitive area and I see my dentist every three to four months to keep a close eye on my gum line. I am happy to report that my efforts have really paid off and I have been able to maintain a healthy set of chompers with two thumbs up from my dentist on each visit. In this post I break down my dental hygiene routine into night and day. This is what I do to maintain my oral health based on the advice of my dentist. You should always talk to your dentist before changing up your routine to make sure you are doing what is best to suit your needs. I dedicate more time to my dental routine at night for a thorough cleaning process. I know this may seem like an awful lot of steps, but it really only take about five minutes total. To me, that is time well spent to keep my mouth healthy! ✻ Oral-B Glide Pro-Health Deep Clean Dental Floss – I start off by flossing. I prefer this floss because it is fine enough to fit between my teeth which sit very close together without hurting my gums. I always rinse with water after flossing. ✻ DenTek Easy Brush Interdental Cleaners Extra-Tight Spaces – I follow up regular flossing with these little brushes which I use just on my top and lower front five or six teeth as I have a tendency to form plaque there regardless of how much flossing I do. These little brushes keep plaque at bay longer between dentist visits. ✻ Plax – Next, I swish with this plaque loosening rinse to further aid in my battle against plaque build-up. ✻ Oral-B Professional Care SmartSeries 4000 Rechargeable Toothbrush – I love my electric toothbrush! I use mine with sensitive brush heads for a gentle yet effective cleaning. I like how it times the two minute recommended cleaning time for you with 30-second allotments per quadrant of your mouth. ✻ Nature’s Gate Natural Toothpaste – I prefer using this fluoride free toothpaste. While this is the only part of my routine that is not recommended by my dentist, it definitely gets the job done as I receive great reports from each dentist visit. I always rinse and gargle with water after brushing. ✻ Waterpik Water Flosser – The last step of my nighttime routine is to use my Waterpik to flush out any remaining particles stuck in my teeth. You’d be surprised at what still remains even after doing all of the previous steps! ✻ Listerine Total Care Zero – I like to dilute about three parts water with one part of this alcohol free mouth rinse in my Waterpik. The combination leaves my mouth feeling clean and fresh! ✻ I floss with Glide and then rinse with water. ✻ I brush my teeth but this time for only one minute instead of two. ✻ I follow up with a quick swish of Listerine Whitening Vibrant mouthwash. This is the only whitening product I use on my teeth as they are quite sensitive. I find that using this daily keeps my smile looking white enough to meet my standards. I’d love to hear about your dental hygiene routine if you’d care to share! This makes me want to be a perfectionist with my teeth! lol. I get way too many cavities (probably around 20 in my lifetime). Good tips. Thanks! How do you ‘drink’ listerine? Since I am the only one who uses these particular mouth rinses, I swig straight from the bottle. Don has his own mouthwash. I’m not a big fan of using the lid cups either. You could just pour a bit into a separate cup if you want to try something differnt. I really enjoyed this video! It is so fun to see other people’s daily routines, so you can compare notes! I have many of the same products you used, recommended by my dentist for similar reasons. But I don’t have a water flosser, and really am now thinking about getting one! I would enjoy any other video like this for sure! I can’t wait for your updated skincare one once you’re ready to share it. I’m always wondering about what creams I should or should not be using at night now that I am nearing 30. Thanks for a great video! Would you consider taking a similar approach when it comes to your blog and (especially) facebook? I love your videos and everything you’ve shared throughout the years has helped me with so many things; I go on your blog and FB to be part of an encouraging community, but there are so many straight up hateful comments that I oftentimes leave feeling down… I am all for people sharing their opinion, but many people who comment on your posts do it out of spite and it is not fair for those of us who would want to honestly support each other. I do have a similar comment policy in place on my blog and my MHWL channel where comments are held for review. I don’t have that option with other social media sites but I try to monitor them as best I can. You can check out my blog comment policy here. Very interesting. I like the tip on the floss brushes and will give them a try. I would like to see a video on manicures and pedicures. Thanks for sharing. I must say, I really enjoyed this video immensely as I have the same dental issues as you. I go to the dentist every 3 months for a deep cleaning. Prevention is the best method!! Hi Jen! I don’t like to comment on Facebook or YouTube because people are just too negative. I personally really enjoyed this video, I think for me, I like hearing about different products that are out there that work especially well for people. I think your tip about diluting the mouthwash with water and using it in your Waterpik is really smart and definitely something I am going to start doing! Thanks for the tip! I’m surprised that you only brush for one minute in the morning. I brush for a long time … like five minutes. I feel like I need to brush longer to clean the surface of each tooth. I’m trying to break my aggressive brushing habits since my gums get inflamed and they’re receding too. The pressure sensor on my toothbrush helps with that. 1. In the morning, I brush my teeth with my Oral-B 5000 on the daily clean setting using a mildly flavored toothpaste (currently Colgate’s Cavity Protection toothpaste). Then I scrape my tongue, spit, gargle and rinse. 2. At night, I do the same exact same routine except I floss before I brush. I haven’t found a staple floss yet. I’m still trying out different kinds. I heard flossing before brushing will help the fluoride re-mineralize the enamel in between each tooth. It makes sense. I tried the extra soft brush heads you use. They’re definitely gentle on the gums and teeth, but I like the feeling of a slightly firmer bristle. 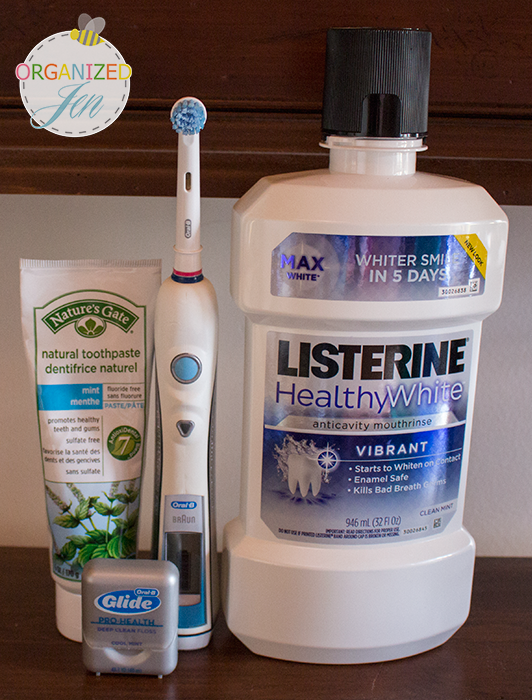 Thanks so much for sharing your dental care routine Jen! It inspires me to take better care of my teeth!! 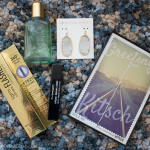 I already use the Glide dental floss – it is my favorite too! It’s the only one that goes between my teeth as well! And I couldn’t live without my electric toothbrush -definitely the best investment ever! I’m curious, what made you decide to start flossing in the mornings? I know everyone has their own personal preferences, but how did you come to that choice? Did you find that the tarter between your teeth builds up over night? Also how did you choose which listerine to put into your waterpik? I just recently got a waterpik and am trying to decide which mouth wash to use. 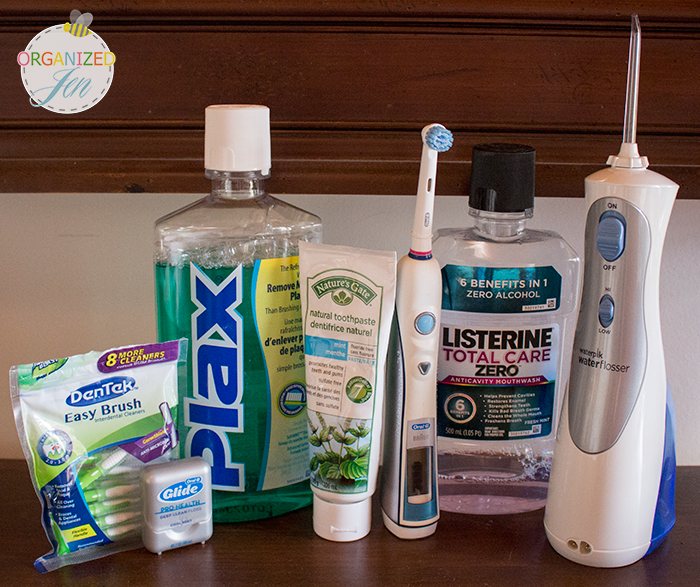 Was there a particular reason that brought you to choosing with the Listerine Zero alcohol free for the waterpik? I floss in the morning based on the advice of my dentist. I started switching over to the zero Listerine formulas because they feel less “strong” in my mouth but still have the same results. I am going to give Listerine Zero a try as I find the regular listerine quite strong too! I loved watching your routine and gained a few tips. I have a question. The waterpik system has certainly come a long way and am wondering if you know of a source (a link perhaps) for the replacement tips? This video was so helpful! I will have to try those disposable floss-brush things. I too am paying the price for being an aggressive brusher as a child/teenager. I would love to see how you organize/store your dental hygiene supplies. Under the sink all in a bin/tote? I have wanted a water pick, but struggle with where I would store it, since I don’t have a ton of bathroom counter space. Thanks so much for sharing Jen. This video was great! I can’t want to try a water pik out! Been wanting on for years and I think you finally convinced me to invest. Random question, but do you do all of this before or after your skin care routine? Thanks Jen! I run through my dental routine before skincare. Hi Jen! Thank you again for sharing with us! I’ve been using the Whitening Mouthwash, but I have a question. The back label says to use it as a prewash. Why do you do it after? Just curious if it is more beneficial to do it after. Also, do you brush you tongue in the 2 min allotted with your brush, or do you do something extra for that? I don’t know, honestly. No particular reason. Also, I do scrape my tongue but forgot to mention that in the post. I bought everything above, except Listerine because I prefer Scope and can I just say after 1 week my teeth look better and the plaque is actually GONE!!! Thank you. I love the Waterpik and it was on sale at Target yippy!! Keep the posts coming. Your newest follower. I actually read an article from a blog by a dentist in Chandler that not all mouth washes are the same. Clearly, Listerine falls under the “total care mouth wash” category, which is recommended by most dentists. i LOVE to floss! I floss so often that I’ve worn little grooves into my gums. My dentist has actually told me to cut back on the flossing. Flossing is FUN, people! Flossing ROCKS. Awesome blog and video! I think it’s fantastic that you are sharing your dental hygiene routine with your followers. It’s a great way to motivate them to take care of their teeth and gums and see a dentist for regular cleanings. Thanks for helping us dentists instill positive oral hygiene habits! You and everyone else will definitely see the rewards for doing so.